THE HILARIOUS AND MULTI-TALENTED JIM STAFFORD!! General Assigned Seating - THE HILARIOUS AND MULTI-TALENTED JIM STAFFORD!! Limited Preferred Assigned Seating - THE HILARIOUS AND MULTI-TALENTED JIM STAFFORD!! Limited Preferred seating inside the great room at surfboard tables, but NOT in front of the stage, and first row of barrel tables behind VIP surfboard tables; $29.00. Limited VIP Assigned Seating - THE HILARIOUS AND MULTI-TALENTED JIM STAFFORD!! Limited VIP tickets will also be available and include up front reserved seats (best available at purchase time), table snacks, and a drink ticket. This ticket does NOT include Meet & Greet prior to the show. VIP tickets are very limited and usually sell out quickly. A single show VIP ticket is $42 and are on a first come first serve basis. 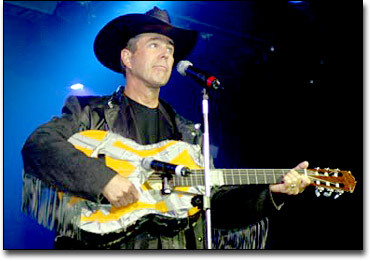 Limited Platinum VIP Assigned Seating (Includes Private Meet & Greet) - THE HILARIOUS AND MULTI-TALENTED JIM STAFFORD!! Very Limited Platinum VIP tickets are $52.00 and includes up front reserved seats, table snacks, free drink ticket and private meet & greet and photo opportunity with the artist prior to show at 6:00ish. Be sure to be in your seat by 6pm to be called on by an usher for the meet and greet. They cannot look for you if you are not seated. Born and raised in Winter Haven Florida, Jim's garage band in High School included Gram Parsons, Bobby Braddock and Kent LaVoie (Lobo) and was fortuitously called The Legends. Jim became a bona fide legend himself in 1974 with his Gold hit single Spiders and Snakes, followed by My Girl Bill, Wildwood Weed, Swamp Witch, and several others, including Cow Patti written for the Clint Eastwood movie, Any Which Way You Can, which Jim also appeared in. In 1975 Jim became a TV personality with ABC's The Jim Stafford Show. He also co-hosted Those Amazing Animals, appeared in 56 episodes of Nashville on the Road, made 26 appearances on The Tonight Show, and appeared on and was head writer/producer for the Emmy-nominated Smothers Brothers Comedy Hour! Jim's first love has always been performing live and he has been a mainstay in Branson, Missouri since 1990 at his acclaimed Jim Stafford Theater. During his shows Jim combines hysterical comedy with masterful performances on the classical guitar as well as heart-warming stories of the human spirit. Critically acclaimed as the "Victor Borge of the Guitar", Jim creates hilarious antics from everyday life taking laughter to a new art form. Don't miss this Florida native in a rare and intimate Florida appearance! Gates open at 5:30pm with food available until 7:00pm from Georgia Boy & Ethel's Famous Wings. Food is not included in the ticket price. Opening music by Johnny Nicks. Our seating is NOT theater style, but we do have tables. Some seats are not directly facing the stage and will require turning to face the front of stage. Early advance general admission tickets are only $19.00 until January 24th 2019. $21.00 through February 21st 2019. $23.00 through March 1st 2019. $25.00 at the gate, the day of. The earlier you purchase the more you save, as well as get the best seating! If you wish to sit in a group with others please be sure to buy the entire groups tickets at one time so we can be sure to have you together. If there are any special comments please be sure to make them when ordering your tickets. Like all our concerts, in order to seat everyone best, we reserved the assigning of seats based on the best available in the order in which they were purchased.